The last post for this year features an article (courtesy of one of my favorite websites, Composites World) describing exactly why Cannondale engineers, who have loved to work with Aluminum in the past, sought after carbon fiber in their Six 13 frame (if you'll remember, the same frame was outlawed by the UCI in 2003 for being "too light"). 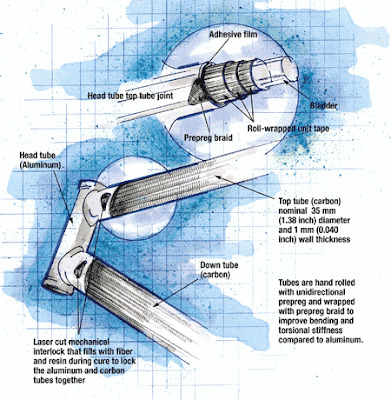 Some of you may be familiar with the carbon fiber "weave" found in racing frames. Well, this article looks at a new "braided" type of CF construction and the some of the decision making present behind going for this cost effective solution. Its also interesting to see the variety of suppliers who helped Cannondale realize these solutions. It is clear that many brains were at work. Those of you who ride Cannondale bicycles, old or new, might be interested in reading the article. Eitherway, I encourage you to also take a look into a virtual factory tour of the Bedford plant. The link to the tour is in my Honeycomb on the left bottom called "Factory Tours - Cannondale (Bedford)" You'll immediately get an understanding of the flexible manufacturing system at the plant. Some other supplemental reading can be found in the "Composites/Plastics" section on the left as well. Topics such as carbon fiber production, bladder-molding process etc, are addressed there so you won't miss out on anything. Its compressibility allows biaxial braid to expand in diameter, permitting an easy fit over a mandrel. Braid can be made from many different fiber types and can range in diameter from 0.25 inch to 24 inches (6.35 mm to 609.6 mm). 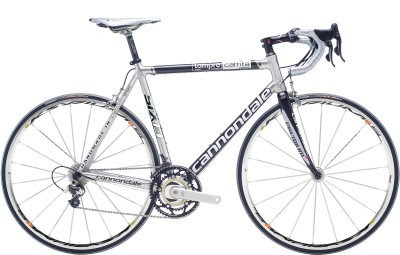 My first real road bike was a Cannondale 3.0. It was a great bike. I think I will own another Cannondale in the years to come.